Skies have remained mostly cloudy this morning which has kept temperatures down as well as the atmospheric instability. The current cloud cover will likely help in keeping the atmospheric energy from reaching levels like it did on Thursday. 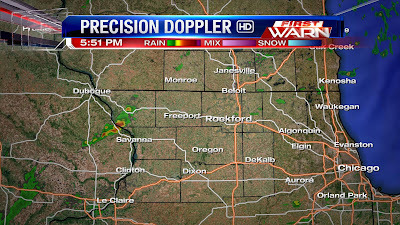 There have been a few showers trying to develop this far north but have had a hard time making it. 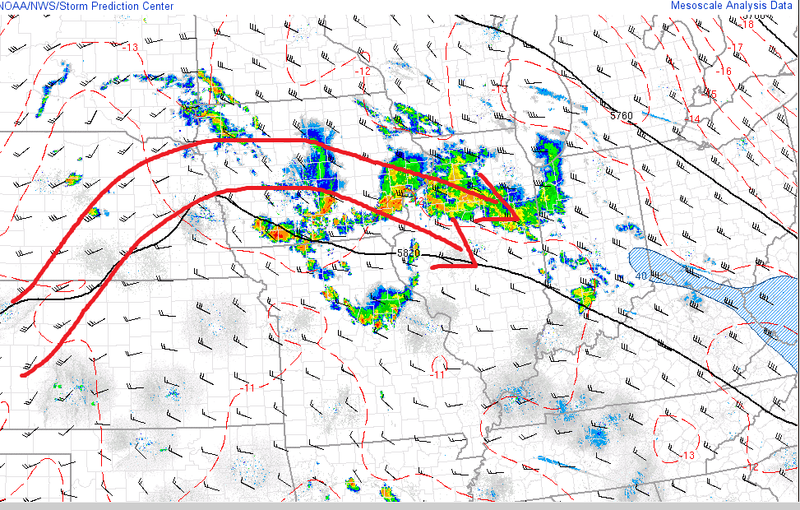 There has been a little clearing to the west in Iowa where the instability has been slightly increasing. The slight risk for severe weather continues for N. IL and S. WI through the afternoon and evening, however, there are a couple areas that hold a higher chance of storms this afternoon. Winds as strong as 115 mph in the jet stream are moving through Iowa up into Wisconsin and could become the focus for thunderstorm development in parts of northern Iowa, southern Minnesota and southwestern Wisconsin later this afternoon. If storms were to develop out west strong southwest winds would quickly lift them into southwest and western Wisconsin this afternoon. As the system progresses to the east later today some of those storms may clip far northwest Illinois. The other area for concern is well south of the Stateline where storms from Missouri earlier this morning have been moving through central and southern Illinois. At this point I would put our severe threat in the low category for the afternoon and evening. Any further updates will be provided here throughout the afternoon as needed. 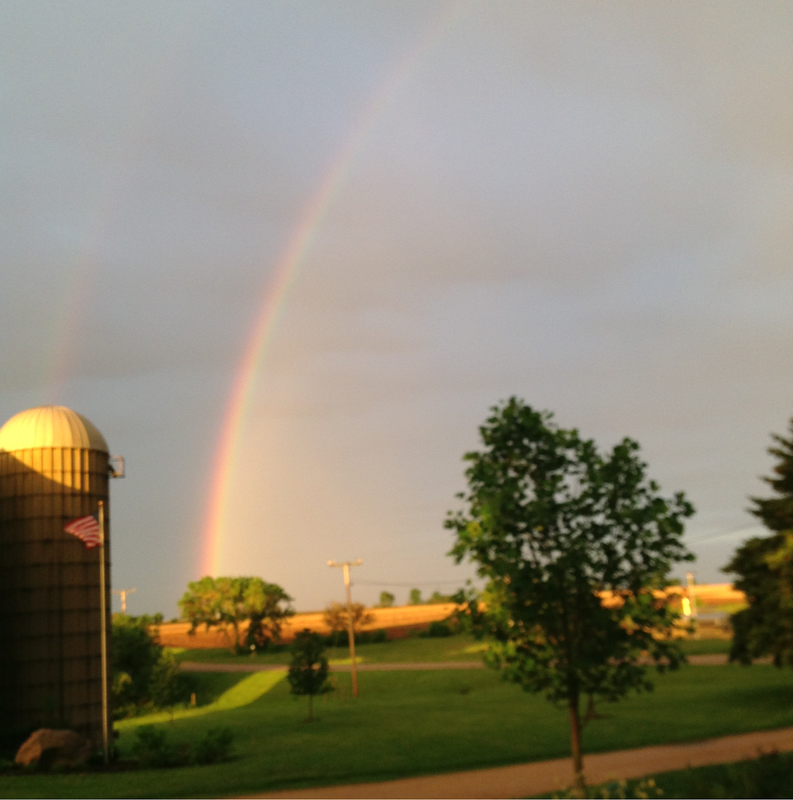 Strong thunderstorms moved through N. IL and S. WI late Thursday afternoon and evening. Numerous wind damage reports were received from Whiteside County up through Rock County. 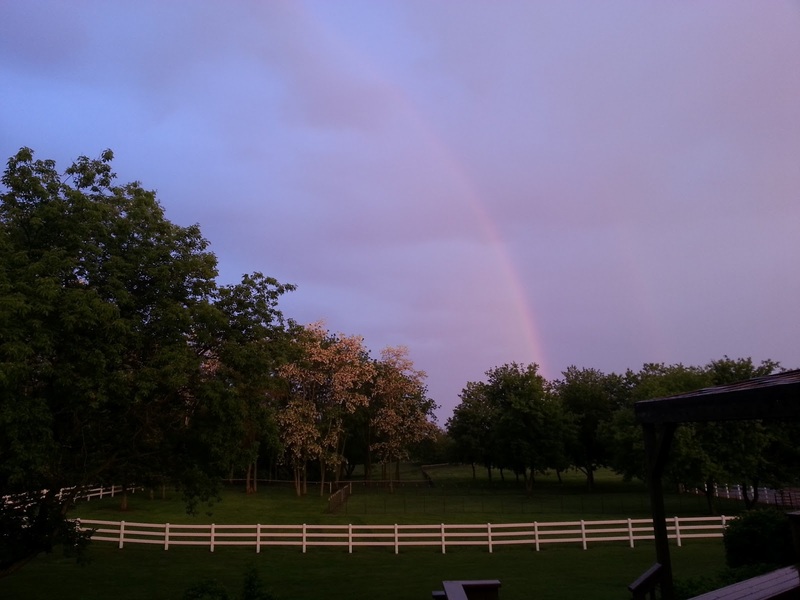 Tornado sirens were sounded in Ogle County and heard from Mt. 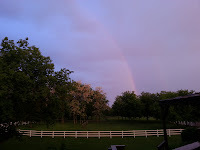 Morris, Oregon and Byron as a strong thunderstorms rolled through the county. 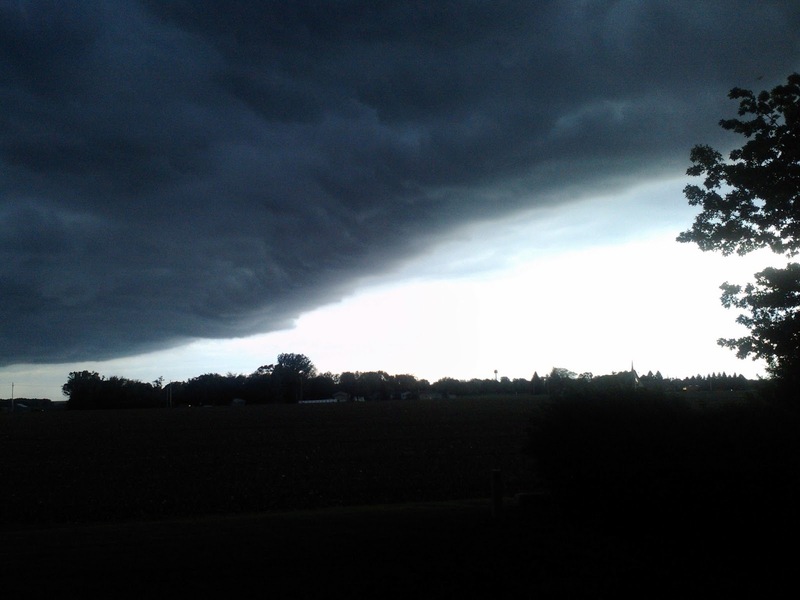 This came after a tornado had been reported near Prophetstown in Whiteside County. While there were no official reports of a tornado there were several damage reports stretching from Lowden State Park up to Stillman Valley. 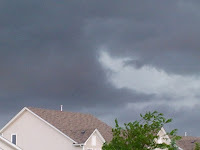 The likely cause for sounding the tornado sirens in Ogle County were possibly due to a gustnado forming along the leading edge of the storms. A gustnado is different from a tornado in the fact that it forms on the gust front of a thunderstorm (or showers) and visible from a shelf cloud and not associated with a wall cloud like a tornado is. These can sometimes be mistaken for tornadoes, but if you monitor it closely you'll notice that it's usually forming ahead of the storm and not under. 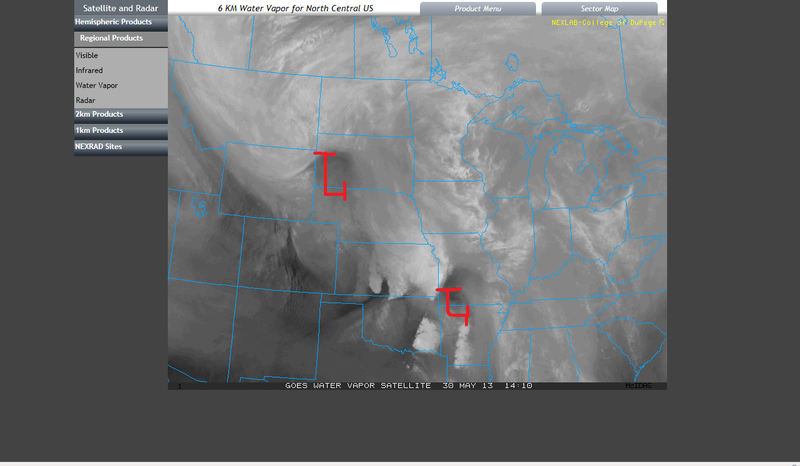 southern edge of the storm complex in Missouri but those are moving southeast and will not impact us. The northern and leading edge of the storm complex is what may impact us this afternoon; especially if it intensifies some through the morning. At the moment heavy rain is just falling in southeast Iowa - no lightning has been detected. The Storm Prediction Center continues to highlight N. IL and S. WI under a slight risk for severe storms this afternoon. If storms were to form damaging wind gusts would likely be the main threat. 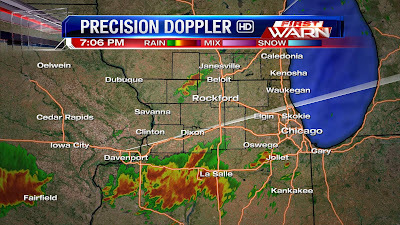 It's possible the strongest storms may slide just to the south of the Stateline so be sure to continue to check the blog through the afternoon as we'll continue to provide updates. 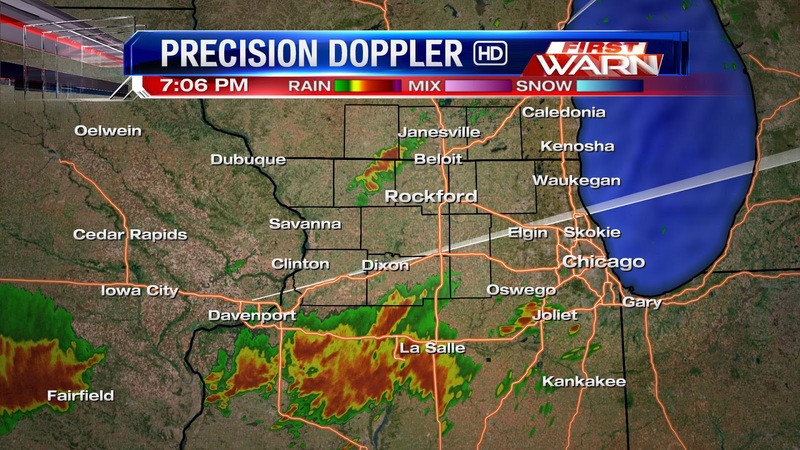 8:15pm Update: The severe weather threat for the Stateline has gone down. All Tornado Watches have been allowed to expire. There remains a Severe Thunderstorm Watch for McHenry County, however, that will likely expire soon. Rain, moderate to heavy, will continue into the overnight. (8:08:28 PM) nwsbot: Local Storm Report by NWS LOT: Polo [Ogle Co, IL] law enforcement reports TSTM WND DMG at 06:20 PM CDT -- trees and wires down. (8:08:28 PM) nwsbot: Local Storm Report by NWS LOT: 2 S Oregon [Ogle Co, IL] law enforcement reports TSTM WND DMG at 06:35 PM CDT -- shed blown down. (8:08:28 PM) nwsbot: Local Storm Report by NWS LOT: 2 N Stillman Valley [Ogle Co, IL] law enforcement reports TSTM WND DMG at 06:45 PM CDT -- trees down. (8:08:28 PM) nwsbot: Local Storm Report by NWS LOT: 2 S Stillman Valley [Ogle Co, IL] law enforcement reports TSTM WND DMG at 06:45 PM CDT -- trees and wires down at holcomb road and stillman road. 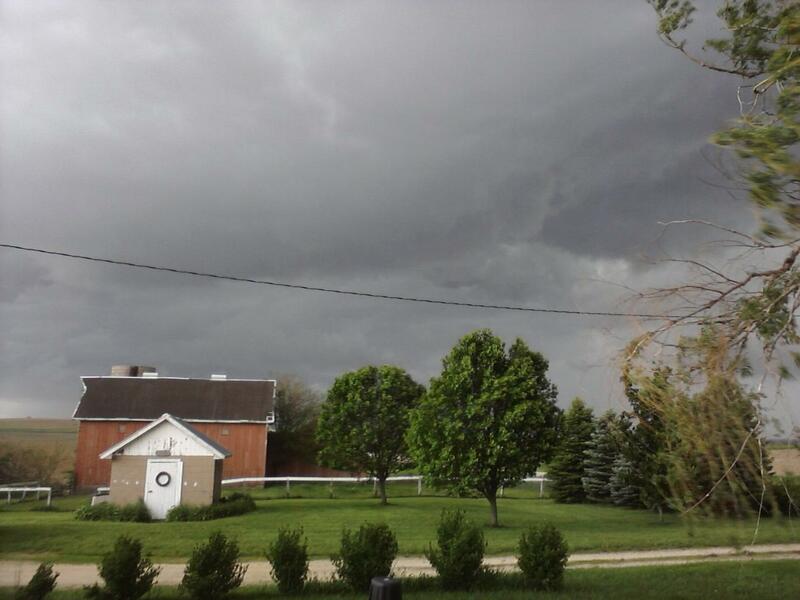 (8:08:28 PM) nwsbot: Local Storm Report by NWS LOT: 3 SE Davis Junction [Ogle Co, IL] law enforcement reports TSTM WND DMG at 07:00 PM CDT -- trees and wires down at lindenwood. 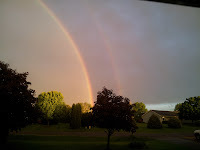 7:57:24 PM) nwsbot: Local Storm Report by NWS LOT: 2 WSW Rockford [Winnebago Co, IL] trained spotter reports TSTM WND DMG at 07:00 PM CDT -- trees uprooted along intersection olgeby and monahue rd about 1 to 1.5 foot diameter uprooted. Severe Thunderstorm Warning continues for eastern Stephenson County until 7:15pm. 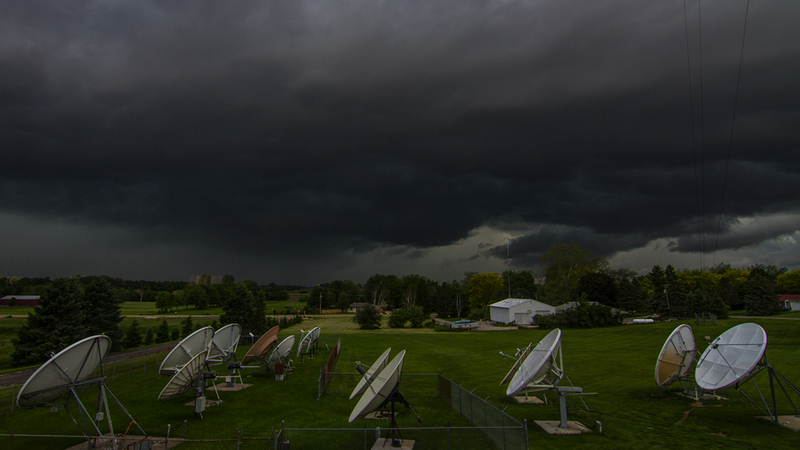 A Severe Thunderstorm Warning continues for Winnebago, Ogle, Lee, DeKalb, Boone and McHenry counties until 8pm. 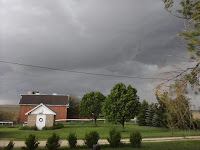 (6:25:58 PM) nwsbot: Local Storm Report by NWS DVN: Freeport [Stephenson Co, IL] emergency mngr reports TSTM WND DMG at 06:17 PM CDT -- some 6 to 8 inch tree limbs down in town. (6:25:05 PM) nwsbot: Local Storm Report by NWS DVN: Freeport [Stephenson Co, IL] emergency mngr reports TSTM WND GST of M59 MPH at 06:17 PM CDT -- sustained wind of 50mph or higher for 10 minutes. 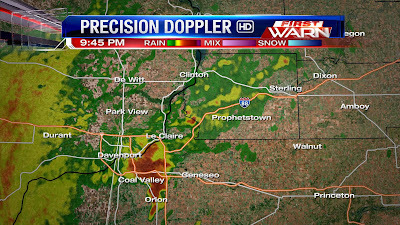 5:45pm Update: A Severe Thunderstorm Warning has been issued for Winnebago, Ogle and Lee counties until 7pm. Strong damaging wind gusts likely, however, there could be a few brief spin up tornadoes along the leading edge of this storm. Areas affected: Stockton, Pearl City, Lanark, Shannon, Polo, Milledgville and Dixon. 5:35pm Update: A Tornado Warning has been issued for Whiteside County until 6pm this evening. A strong line of storms are currently moving into southwestern Whiteside County and it's possible along the leading edge of the line a few brief spin up tornadoes could occur. The line of storms is moving to the northeast at 50mph. A fairly significant squall line has developed from Cedar Rapids southwest through the Quad Cities down towards Galesburg late this afternoon. This line has produced significant wind damage near Burlington, IA with numerous reports of trees down and power poles snapped. The current track of the storm puts it in Whiteside County between 5:00pm and 5:30pm and closer to Rockford between 6:00pm and 6:30pm. 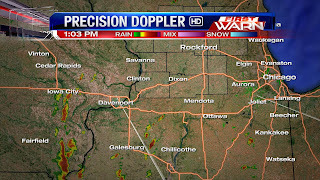 3:55pm Radar Update: Storms developing to the west in Jo Daviess County and Carroll County could produce pea to nickel sized hail along with wind gusts between 40-50 mph. 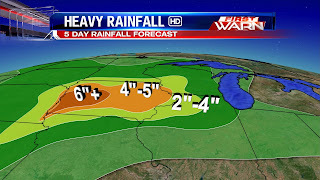 Heavy rainfall likely as well. Storm is near Savanna with another cell near Elizabeth and just northwest of Stockton. 3:10pm Update: Severe Thunderstorm Warning for far southwestern Whiteside County until 4pm. Radar Update 2:45pm: A Severe Thunderstorm Warning remains in effect for Lee County until 3pm. Areas impacted remain Franklin Grove and Amboy with heavy rainfall, wind gusts near 60mph and quarter inch hail. 2:00pm Update: Severe Thunderstorm Warning for Lee County until 3pm. 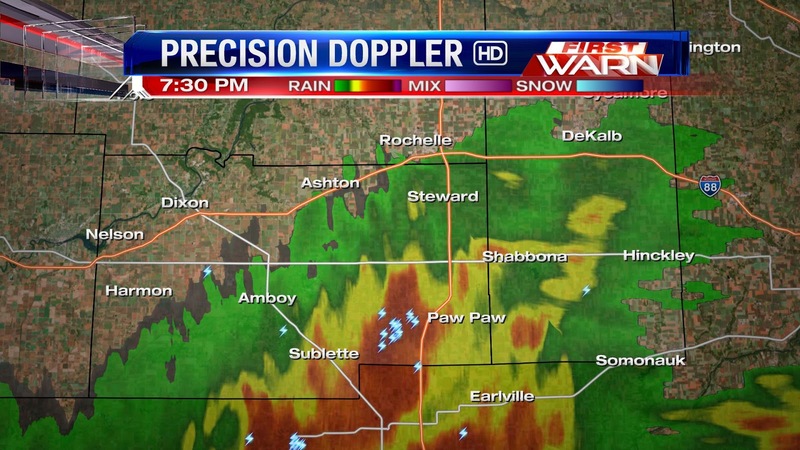 The warned storm remains south of the Lee/Whiteside County line and will be near Amboy around 2:30pm and Dixon around 2:40pm. 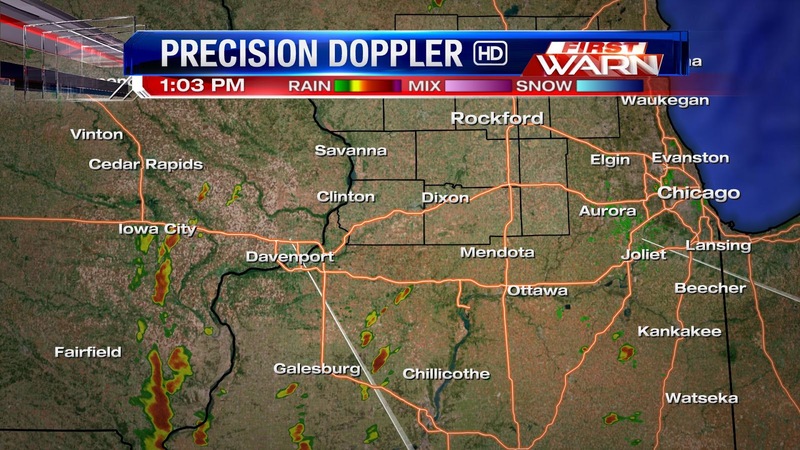 Radar update: Storms are beginning to develop south of I-80 as of 1pm. 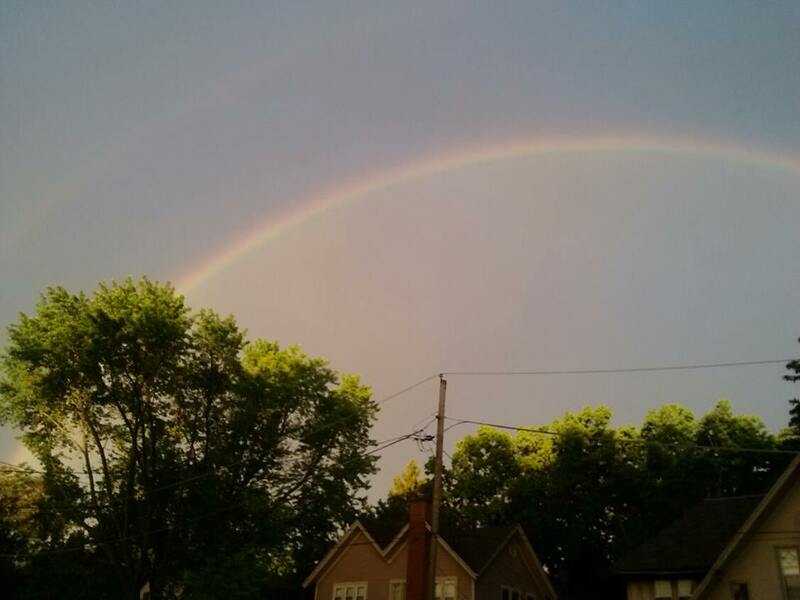 These will continue to lift north over the next couple of hours. 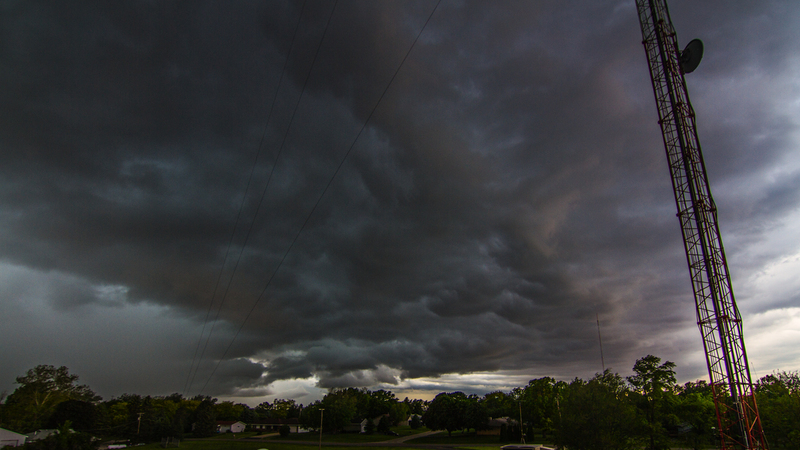 There are no warnings out for these storms just yet, but I would imagine they would be coming out shortly. 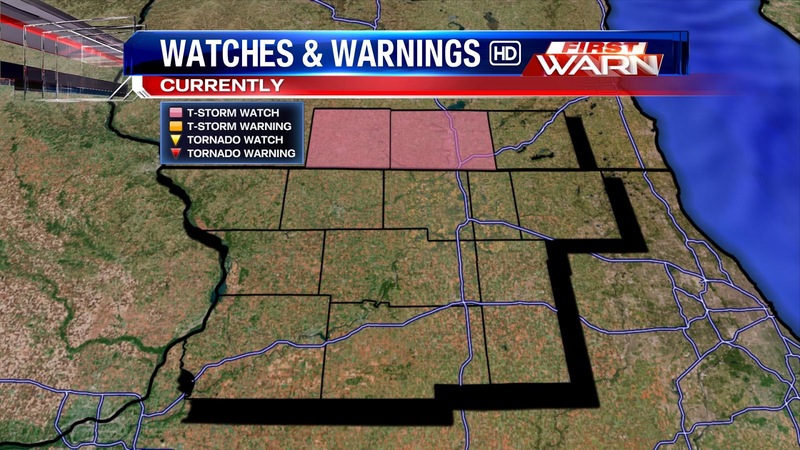 A Tornado Watch has been issued for Green and Rock counties through 7pm and for Stephenson, Jo Daviess, Carroll, Whiteside, Winnebago, Ogle, Lee and DeKalb counties until 8pm. 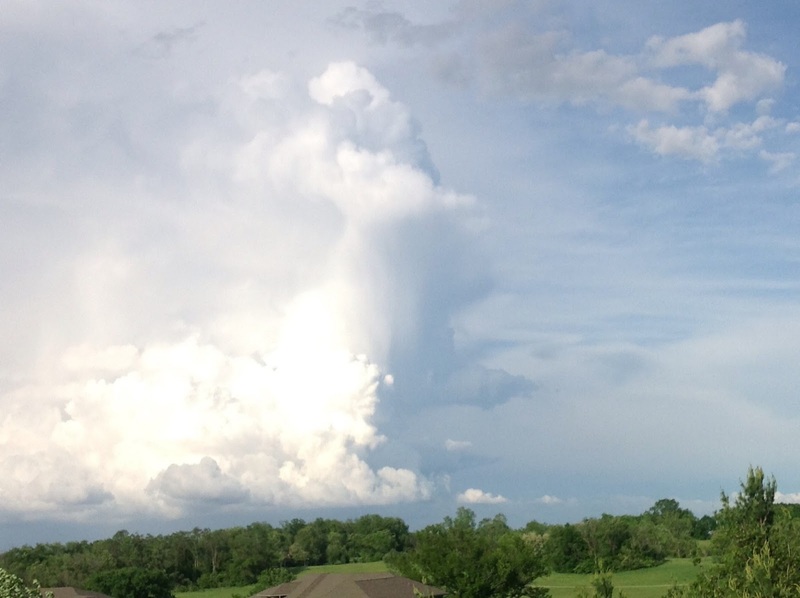 We're currently monitoring two areas for potential storm development this afternoon. 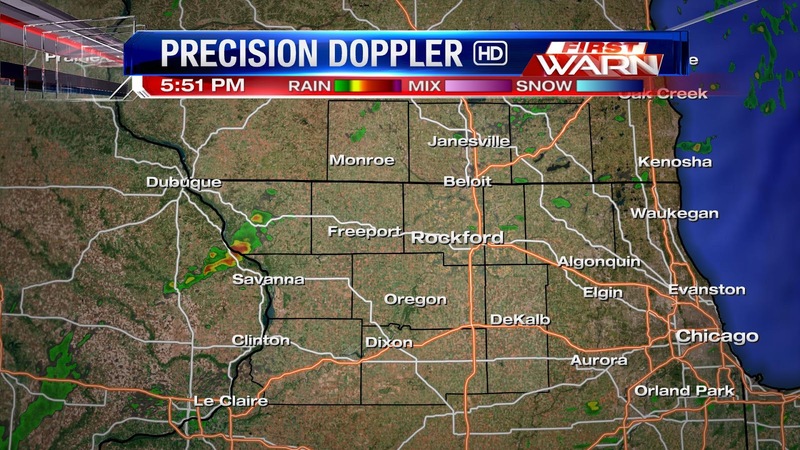 A few showers have formed in northeast Iowa and southwest Wisconsin and will continue to lift north. As of right now they are just showers but could develop into thunderstorms within the next couple of hours. The second area for concern is a little further south towards west-central Illinois and southeastern Missouri. Thunderstorms have been developing ahead of an upper level low and are expected to increase in coverage as they track north. It's likely a severe weather watch will be issued for parts of Wisconsin and also for Illinois very shortly. The threat for wind seems to be increasing this afternoon; especially if storms move in from the south. Be sure to keep checking back for further updates! Temperatures didn't fall much Wednesday night and with a mild start already Thursday morning we'll be back into the low to mid 80s by the afternoon. 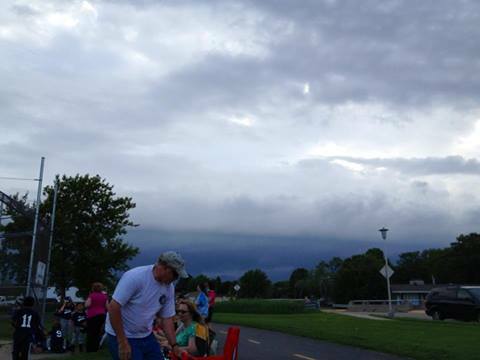 Skies started off mostly clear but developing cumulus clouds have quickly moved in. There have been a few showers developing (or I should say trying to develop) south of Chicago and to the west in Iowa but as quickly as they been developing, they've also haven't been able to sustain themselves giving a little clue that the atmosphere might be just a little too stable for anything to develop just yet. Skies will likely remain dry for the next couple of hours but look for an increase in precipitation by this afternoon. 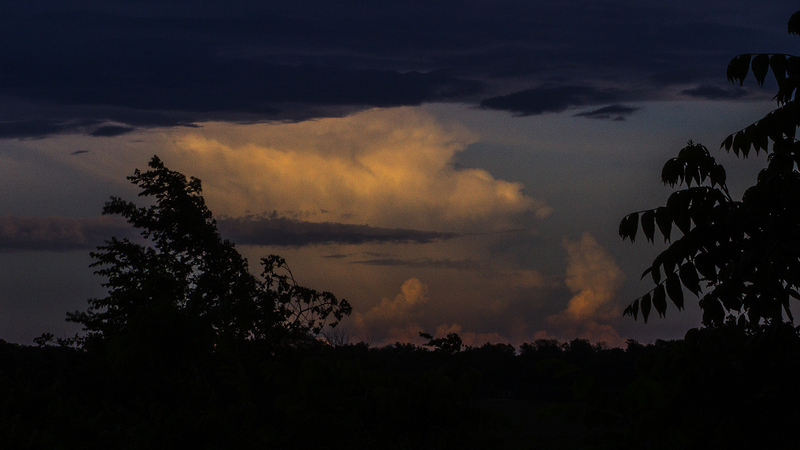 Thunderstorms have been ongoing across parts of Kansas and Missouri as a result of low pressure moving through the Kansas/Missouri border. 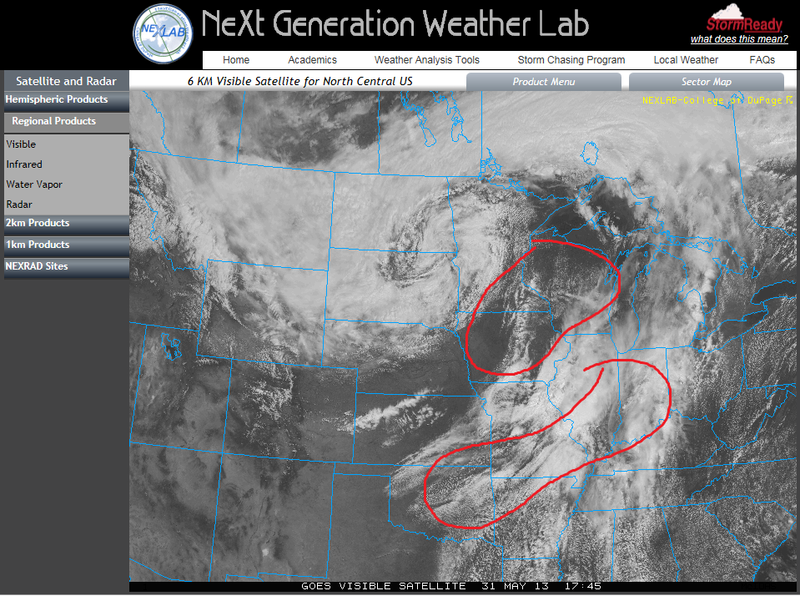 This low will begin to lift north through the afternoon into Iowa and eventually Wisconsin by tonight. A few widely scattered thunderstorms will be possible through mid-day but as the upper level disturbance moves closer an increase in coverage of storms is expected. Still looks like heavy rain and strong, damaging winds will be the main threats with hail and tornado threats on the lower end. The slight risk remains across northern Illinois and southern Wisconsin for both today and tomorrow. The National Weather Service has issued a Severe T-Storm Watch until 2:00am for the following counties: Rock and Green in southern Wisconsin. 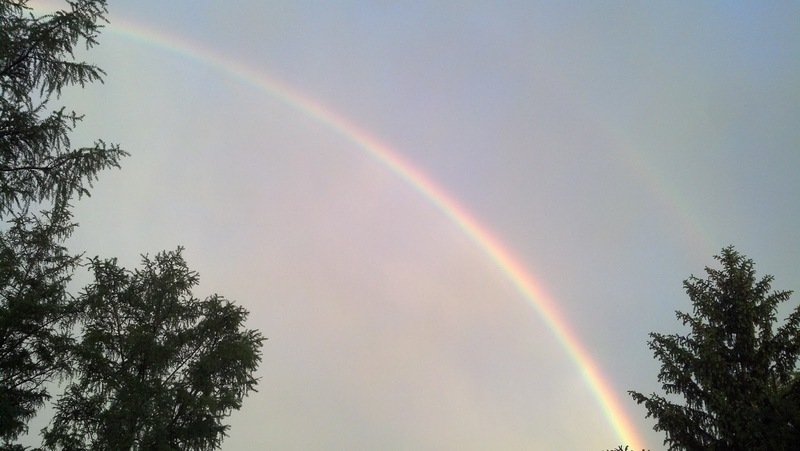 Skies have cleared in the wake of showers that passed through early Wednesday morning. The clearing skies combined with the abundant atmospheric moisture will cause instability to increase through late morning and afternoon. Thunderstorms have been 'bubbling' in parts of southwest Iowa and eastern Nebraska. While those storms will gradually shift east with time, the general storm motion is more north and northeast. Once again our eyes will be watching southern Iowa and northern Missouri this afternoon for any additional storm development ahead of a weak upper level disturbance moving out of Kansas. The surface warm front remains north in Wisconsin but there is also a weak frontal boundary in place across northern Illinois. As the upper level disturbance moves closer to the boundary it may become the focus for isolated thunderstorms late this afternoon and evening. Areas in northwest Illinois and southwest Wisconsin remain under a slight risk for strong to severe thunderstorms. This threat extends through the upper Midwest and Plains. Daytime heating this afternoon will allow the cumulus clouds forming now to grow in height by mid to late afternoon. 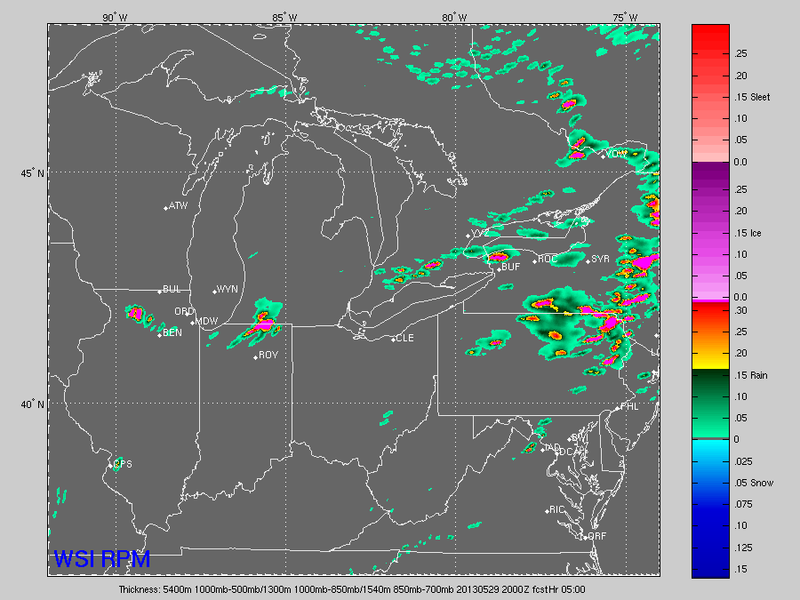 The image on the left is the RPM futurecast radar at 3pm and shows thunderstorms developing south of Rockford and lifting north. If this scenario were to actually occur hail and damaging winds would be the primary threats. 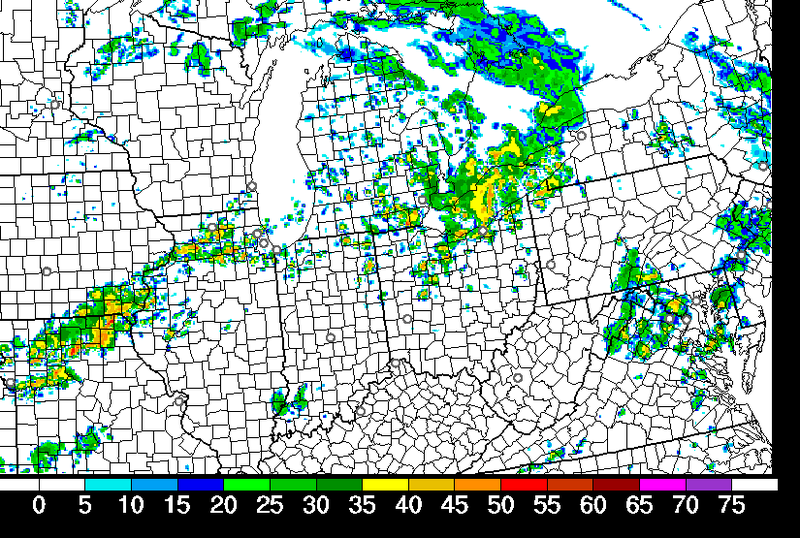 Also, any thunderstorms that do form would be very efficient at producing heavy rainfall. 9:45pm Update: Storms entering Whiteside County around 10:00pm are capable of producing 35mph winds, 0.5" hail, heavy rain and frequent lightning. 8:00pm Update: Still no watches or warnings, but a storm has developed in Carrol County, moving east-northeast. 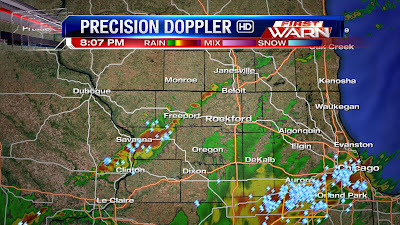 Plenty of rain will be possible with these slow-moving storms, especially areas around Rockford later tonight. 7:33pm Update: No T-Storm Warning, but storms in Lee and DeKalb Counties capable of 50mph winds, 0.5" hail, and heavy downpours. Affected cities will include Paw Paw and Shabbona. 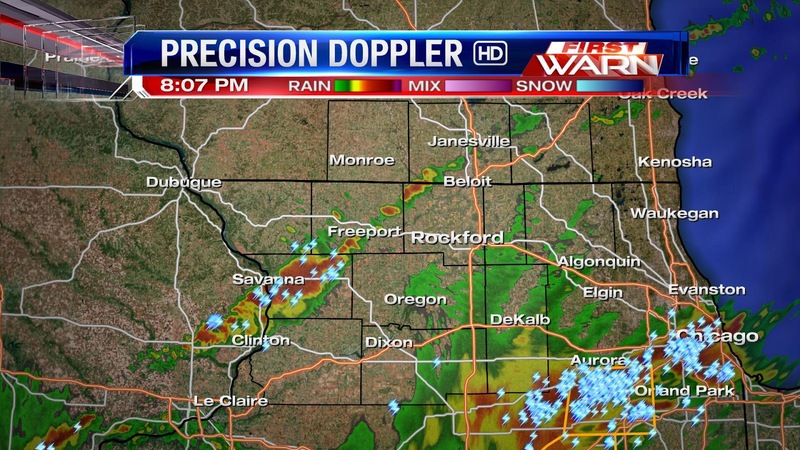 7:00pm Update: At the moment, storms are staying south of the Stateline. None of these storms are severe, but they will be capable of dropping several inches of rain due to their slow movement. 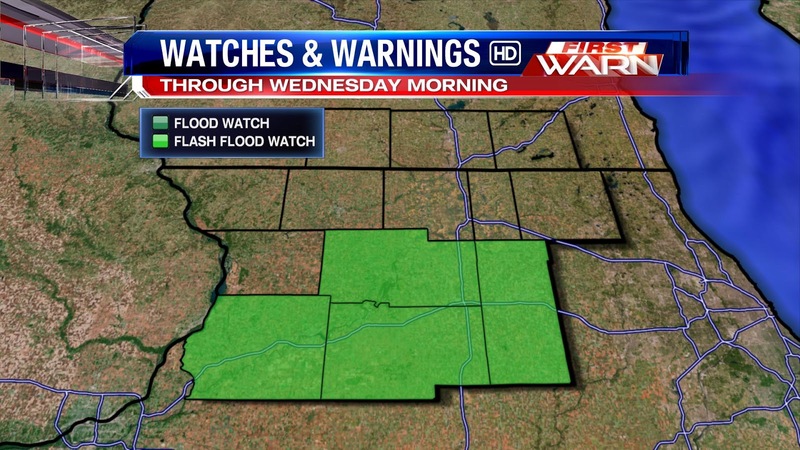 Because of this, the National Weather Service is growing a little more concerned about flash flooding for our southern counties and has expanded their Flash Flood Watch to include Whiteside, Ogle, Lee, and DeKalb counties through Wednesday morning. 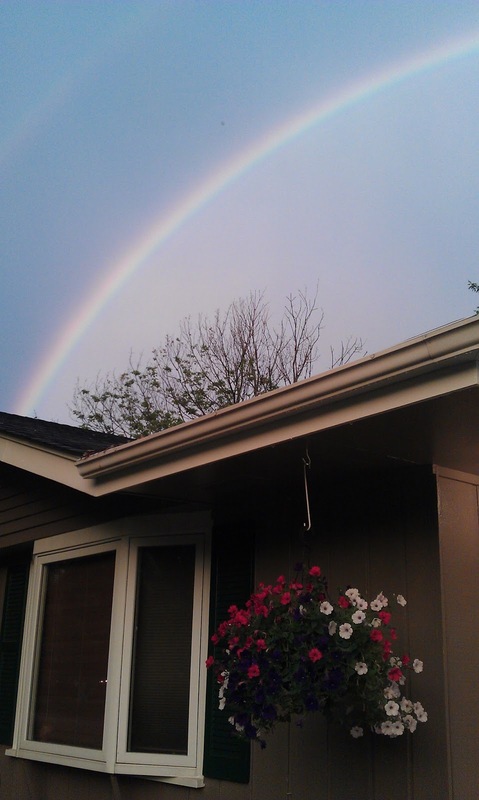 Original Post: We are tracking the potential for severe storms across the Stateline tonight, especially later this evening. 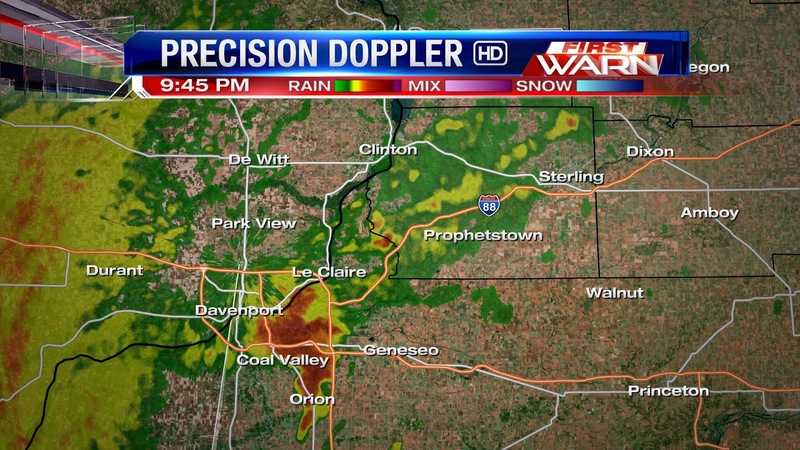 Precision Doppler is showing some rain moving into Jo Daviess and Carrol Counties just before 6:00pm, but no thunderstorms at this time. The more active weather is still to our southwest. 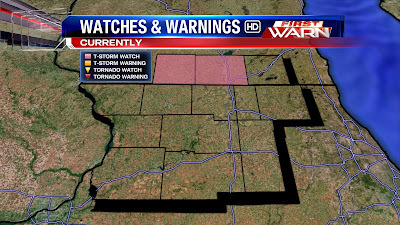 Here's a look at watches and warnings as of 5:40pm. A Tornado Watch is in effect until 10:00pm for northern Missouri and southeastern Iowa. The closest severe weather is to our south... a Severe T-Storm Warning is in effect for Knox and Stark Counties in Illinois until 6:15pm. When these storms move into the Stateline this evening, the main threats for severe weather will be strong winds and hail. While a tornado will be possible, it will only be a small chance. 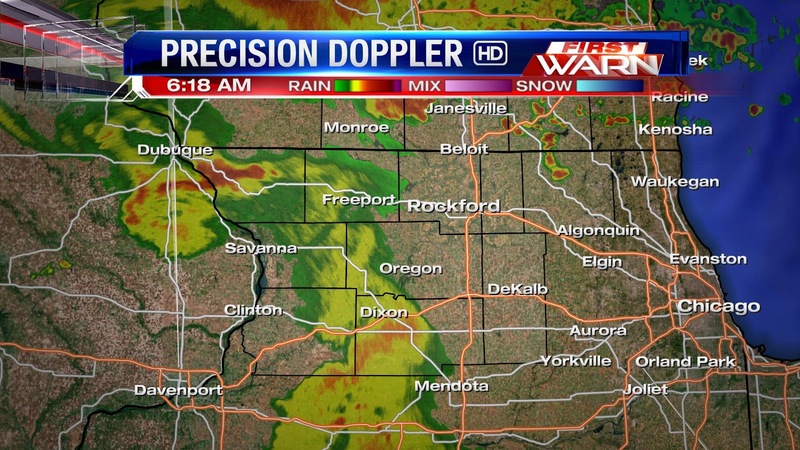 A few light showers have popped up on radar late this morning right around Ridott, Winnebago, Pecatonica and Rockford. Other than maybe a brief shower or sprinkle much of the afternoon will remain dry. Skies have remained cloudy through the morning with only a few breaks in the clouds occurring from time to time. Instability has been building south of the Stateline where a little more warmth and sunshine have occurred - although there has been a slight increase in instability further north into northern Illinois. Wisconsin going through the afternoon, but it's the disturbance in Kansas we'll be watching closely this afternoon as it moves northeast. There have already been a few showers/storms developing ahead of that low and just to the south of Kansas City, MO. Winds within the Jetstream would take any storms that develop in northern Missouri and lift/expand them further east and northeast following the main flow in the upper atmosphere. 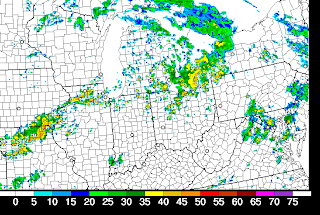 Here is a snap-shot of the 'future' radar from one of our short-term models (HRRR) at 6pm this evening. Expected thunderstorms in northern Missouri later today will begin to lift northeast into west-central Illinois by mid-afternoon and into Illinois around 5pm/6pm. The Storm Prediction Center continues to highlight northern Illinois and southern Wisconsin under a slight risk for severe weather today with the greatest risks remaining wind and hail. With the warm front in close proximity any storms that do develop may have to be watched for signs of rotation closer to the warm front. Eyes will be watching to the southwest to see exactly what develops in Missouri and southern Iowa because that will determine what we see later today. 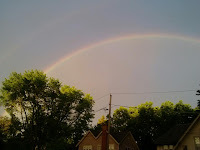 Right now it looks like things should remain quiet until possible after 4pm. 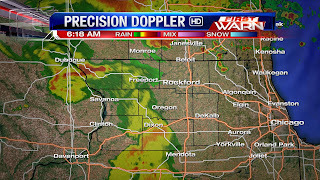 (9:11:42 AM) nwsbot: Local Storm Report by NWS MKX: Edgerton [Rock Co, WI] trained spotter reports HEAVY RAIN of M2.01 INCH at 09:00 AM CDT -- rainfall from midnight to 9 am. (7:39:01 AM) nwsbot: Local Storm Report by NWS DVN: Galena [Jo Daviess Co, IL] co-op observer reports HEAVY RAIN of M1.13 INCH at 07:00 AM CDT -- 24 hour total. Showers with a few embedded thunderstorms have been moving north into Wisconsin early this morning. 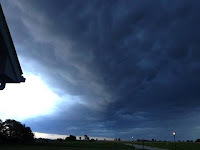 This storm complex was once severe weather in the Plains late Sunday evening but it's been weakening as its been moving east. Thunderstorms will continue to lift north near Madison and Milwaukee this morning with light to moderate rain moving through northern Illinois through mid-morning. 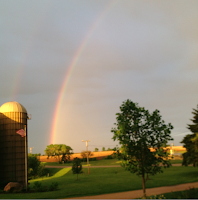 Strong thunderstorms producing significant rainfall have mostly bypassed the Stateline this weekend but that may change heading into the last week of May. 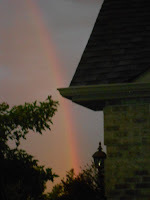 Even though the weekend has been fairly cloudy and cool we haven't had too much in the way of rain Saturday and Sunday. Heavy rain producing thunderstorms continue to move into southeast Iowa and west-central Illinois Sunday evening following the wind flow at roughly 15,000ft which is from northwest to southeast. While we have had a few more moderate showers; especially south of Rockford, storms producing 1"-3" of rain this evening have remained south. 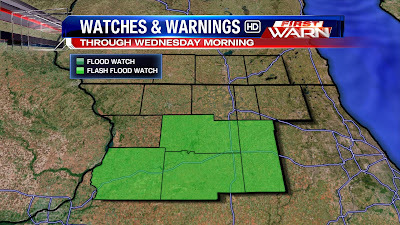 Flash flooding has been occurring in eastern Iowa and west-central Illinois. 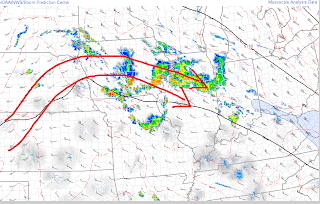 The active weather this past weekend has been the result of a stationary boundary positioned from the central Plains to the Iowa/Missouri border and into southern Illinois. This has kept a cool easterly wind at the surface across northern Illinois and southern Wisconsin keeping our air mass fairly stable. This boundary, however, will begin to shift north Monday and Monday night bringing the heavy rain threat into northern Illinois and southern Wisconsin early this week. As it does moisture from the gulf will also lift north with the help of the low level jet and interact with the warm front producing heavy rain and thunderstorms. The placement of the warm front is critical in determining just where the heaviest rain axis will lie. Right now, it looks like Monday night into Tuesday would hold the greatest potential for heavy rainfall. With the warm front in southern Wisconsin Tuesday and weak upper level disturbances moving through the threat for strong to severe thunderstorms will occur and the Storm Prediction Center has the area highlighted under a slight risk for severe storms that afternoon. The warm front may lift far enough north Wednesday to keep only an isolated threat for storms in the forecast but the main system will begin to shift east Thursday and Friday. Heavy rain and strong storms will be a big concern heading into Thursday night and Friday afternoon. The 5 day rainfall forecast is beginning to indicate some locations receiving in excess of 4" of rainfall...additional from what they received this weekend! Areas across the Stateline could stand to receive 2"-4" of rain by the end of the week. However, if we experience any training of thunderstorms like what's occurring in Iowa then rainfall totals would significantly increase causing the potential for flash flooding.